Since Grandma’s providing no clues about what was happening in the Muffly household, I’m left to guessing. Since, the days are getting cooler, the kitchen stove probably was no longer enough to keep the house warm. Was a stove in the living room now also being used? Posted on October 28, 2014 October 28, 2014 by SherylPosted in AdvertisementsTagged 1914. My maternal grandparents used a coal stove in the kitchen to cook and keep warm. Our old farmhouse had a small oil burner in the kitchen and a big one in the living room. By the time I came along my family had a furnace, but I can remember several neighbors who still used coal stoves. Despite Helena’s silence, I’m really enjoying these tidbits you’re finding. Look at that — five hundred styles! They did put out a lot of heat, that’s for sure. I still remember having to open the windows in a cabin in mid-January because a stove like this had made things just too hot! I’m glad you are enjoying them. It was so difficult to adjust temperatures with the old stoves. I can remember my father talking about how it sometimes would to be too hot near the stove; and too cold in distant corners of the room. I like the design of that stove, you could really watch the flames burning, just like a fireplace. It did have a nice design–and being able to see the flames would make the room seem cozy. OK, I want one now! I have the perfect spot for it. 🙂 The old stoves create such a nice ambiance. Oh my gosh, did you post this for me?!! I just got back from Kalamazoo, too. Posting a couple photos tomorrow. By the way, I was looking up the Dr. Denton mill my husband used to work at (his dad was the manager) and one of your 2012 posts showed up! I couldn’t respond at the time, but that was pretty cool. Yes, I hoped that you’d stop by this blog today. I always enjoy reading your posts about Kalamazoo , and thought that you might enjoy this ad. And, it’s amazing that you also have a connection to the Dr. Denton Mill. That post has been surprisingly popular. 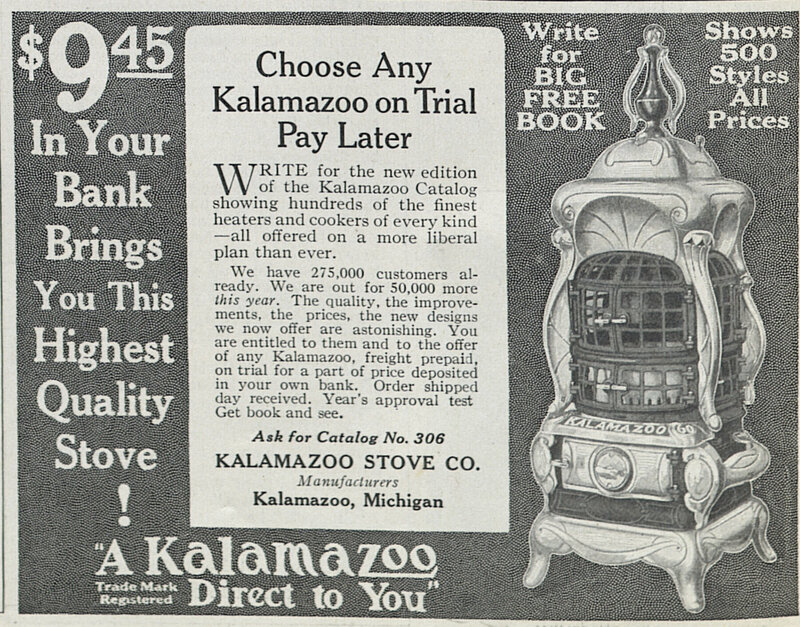 I don’t know if you remember when I posted about my great great grandmother who picked up the burning stove and got terribly burned, but it’s too bad it wasn’t a “Kalamazoo Stove” ;). I just went to your site and reread the sad story. Whew, sounds awful. Thank goodness she healed from her wounds.The old stoves could be so dangerous–and the flowing clothes women wore back then didn’t help. That story really affected me. What an ordeal to live through. It was clear from the newspaper articles that they really didn’t expect her to survive. Good thing she did so that she could live to know her first grandchild. My grandfather was her 2nd, but she died a few months before he was born. By the way, my father-in-law “invented” the Dr. Denton’s PJs with feet for adults. Interesting. . . they are such fun PJs! We have a wood burning stove on our solarium but I would much rather have this one that has the grate so you could watch the fire. Sometimes I wish that we had a wood stove. They make a room so nice and cozy. It is so easy now. . . We can just adjust the thermostat if we’re too hot or too cold. What on EARTH is she up to??? Has she found a boyfriend? We often think, as we journal, our entries need to be earth-shattering revelations. But reading her daily activities and concerns really brings her era home to us. Love the ‘halloweening’ mention. What fun. If anything I wish that she’d included even more detail about mundane things. Times have changed so much over the years–and it would be nice to know what she ate for meals, what her bedroom looked like, and so on.